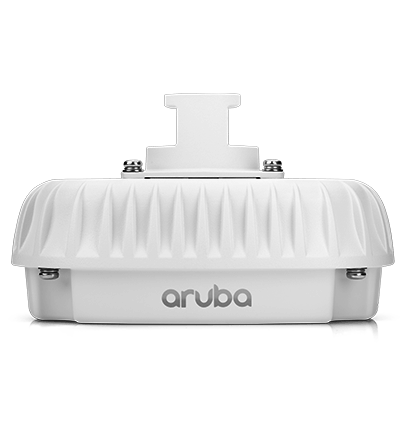 The Aruba 387 access points are a cost-effective, simple to deploy and high performing point-to-point solution that is built upon Aruba’s hardened outdoor portfolio. Weather-proof and temperature hardened, the Aruba AP-387 withstands the harshest outdoor environments. With a maximum concurrent data rate of 2.5 Gbps in the 60GHz band and 867 Mbps in the 5GHz band, the AP-387 delivers an aggregate peak on air data rate of 3.37 Gbps. The AP-387 is perfect for quickly and reliably connecting remote buildings, overcoming right of way issues or installing failover links in the event of line cuts or crushed conduit pipes. The AP-387 uniquely leverages intelligent 60GHz radio auto-alignment at deployment and during operation. Uniquely designed with two separate radios in the event of 60GHz failure, the AP intelligently falls back to the 5GHz radio. Hardened hardware ensures your point-to-point Wi-Fi can endure extreme temperature and moisture. Available channels: Dependent on configured regulatory domain. Dynamic frequency selection (DFS) maximizes the use of available 5GHz RF spectrum. Maximum ratio combining (MRC) for improved receiver performance on 5 GHz. Cyclic delay/shift diversity (CDD/CSD) for improved downlink RF performance. Short guard interval for 20MHz, 40MHz, 80MHz on 5GHz. Low-density parity check (LDPC) for high-efficiency error correction and increased throughput. Power over Ethernet (PoE): 802.3af with some operational restriction. * Recommended bracket solutions for most apps.